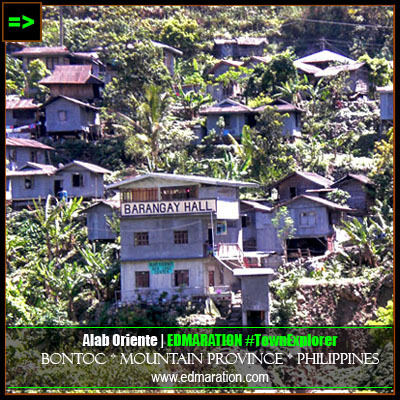 "Bontoc is overshadowed by the adventures Sagada town could offer. 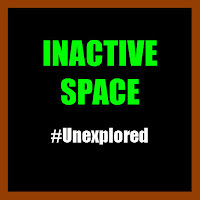 The former is less publicized compared to latter." 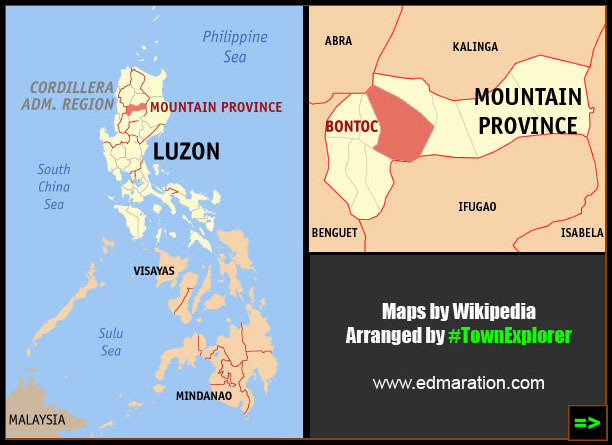 Bontoc, the capital of Mountain Province has just gained an unfortunate location (in terms of tourism) being close to the tourist town of Sagada which can be reached via a 45-minute jeepney ride from this town. The publicity over Sagada overshadows Bontoc. I would want to share the things I discovered in Bontoc. There are a lot of things more to see and do here. But for now, let me share the following to you. I'll be back for sure to cover the places I've missed. 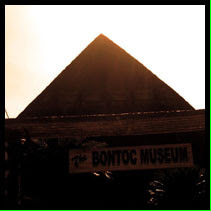 Bontoc Points of Interests included in this post are: Bontoc Museum and mini Bontok village | Kadchog Rice Terraces | Alab Village | Chico River | Mt. Gotong | Palali Rice Terraces | Alab Petroglyphs | Ganga House | Ganga Burial Caves | Samoki Village | Bayyo Rice Terraces | and Lang-ay Festival. TEASER: "The presence of the rice terraces is an evidence of the engineering expertise of the Igorot ancestors..." in Bayyo, Bontoc is a worthy stop-over along the Bontoc-Banaue road. This breathtaking vista can be seen when going to Banaue from Bontoc. If you have your own car, much better, because you can stop anytime. This view can be seen along the road. No need to hike or trek. 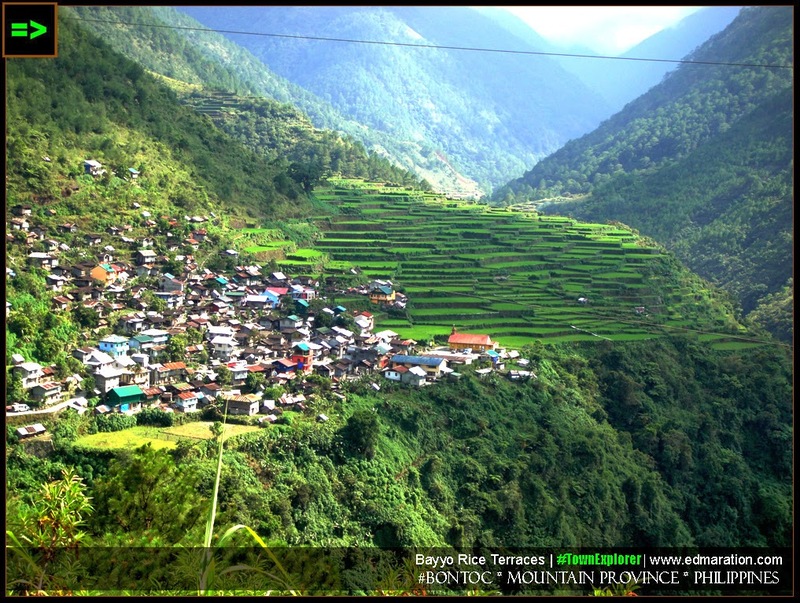 How to go here: From Bontoc, ride a Banaue-bound jeepney located near the Bontoc town hall. Then drop to Bayyo Rice Terraces. If you don't want to drop here, you can just enjoy the view from your window while on your way to Banaue since not all jeepney drivers will grant your request to stop here and wait for you. Good thing, our jeepney driver volunteered to have a quick stop over here when he saw I am struggling hard to capture a photo of this view. The other passengers did not complain! Lucky kid. TEASER: "It is a place where I found the authentic answers to my questions. 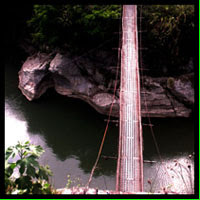 ", a 15-minute walk from the Bontoc town hall. 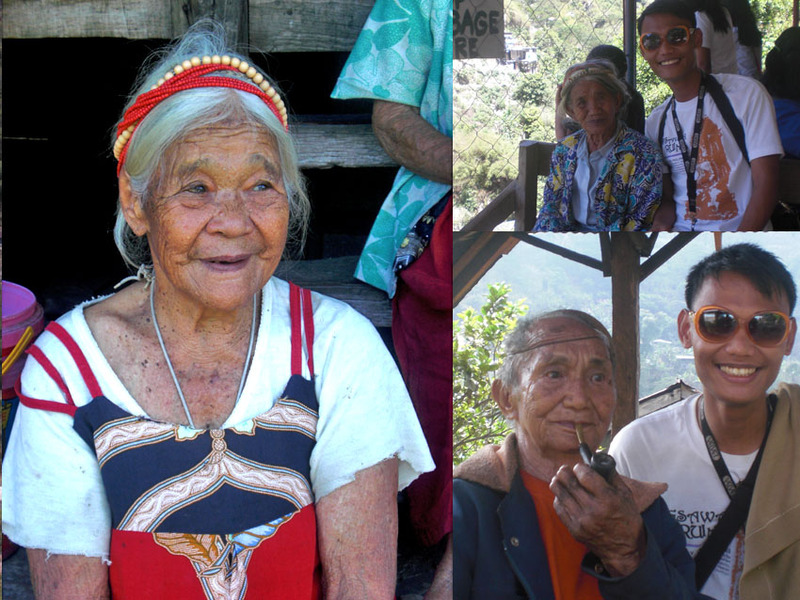 This is a must-see place even if Sagada is your destination-of-choice because it provides interesting information about the way of living of the people in the province, their culture and heritage. It will make you appreciate the things you are seeing in this province -- the rice terraces, the burial caves, the people, etc. Kadchog Rice Terraces is located across the Chico River in Bontoc. This towering rice terraces is located near south of the town center. You can also see this on your way to Bontoc via the Halsema Highway. 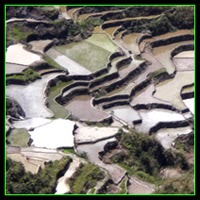 It is just one of the many rice terraces you can see here in Bontoc. TEASER: ...there is still a little regret in me that I didn't just even notice the summit of the first real mountain I ever climbed." 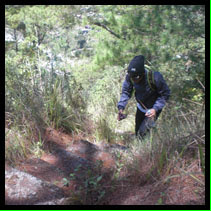 is a great leisure climb when you are in Bontoc. The mountain is located in Alab Oriente Village. The villagers require that you must have a guide when climbing this mountain. For newbie mountain climbers like me, this is a good start. There is a 1000-step stair that will lead you to the top. But of course, you also need to hike on dirty trails because that stairway is just a part of the whole trail. If you want more thrill, there is another trail going up without the stairway. But you will descend in the same stairway though. There's no way we can get rid of that stairway - talking about the safety of mountain climbers. Moreover, Mt. 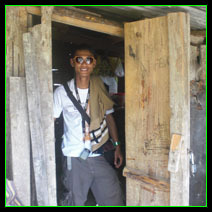 Gotong is just a prelude for the great adventures you have to see in Alab Oriente Village. 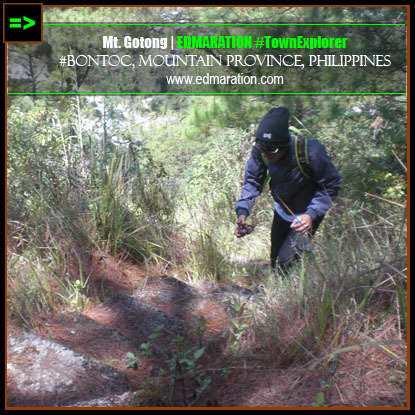 It requires that you have to climb this mountain first for you to see the best kept secrets of the Bontok Igorot's heritage. TEASER: "As I reach the peak, which is the climax of everything, my eyes bulged in pleasure brought by a feast-to-the-eye-destination with a little bit of brain clouding. I have just reached the point of no return.". If you have a guide, ask him/her how you switched from one mountain to another. I forgot to ask and until now I still can not figure out how. First look at the photo you might ask what is this. Well, don't underestimate what you are seeing because these are rock carvings at the top of the mountain that have been carved sometime in 1500 B.C.! TEASER: "It was carved inside a space of time from another dimension of civilization even far from the dawn of Christianity..." according to UNESCO: The other set of Petroglyphs are those found in Alab, Mountain province carved on boulders on top of promontories. The configurations are those of pudenda. The dating is relatively later and placed at not earlier than 1500 BC or even later. 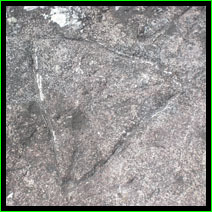 TEASER: "Still, it is significant because it is an ancient mark, an evidence of prehistoric civilization. The trek continues..." is a mysterious stone house made up of massive stones with pointed top and a space of about 3 feet from the ground to the ceiling. 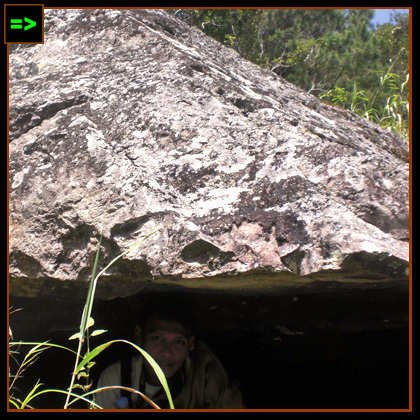 It is said to be the hiding place of the locals during the world war and an abode to ancient Igorots (prehistoric). 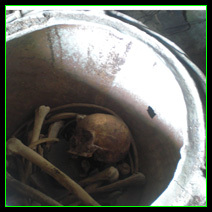 TEASER: "I experienced goosebumps upon entering this area of dead bodies that made me feel I was in a different dimension." 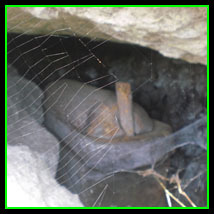 is probably the most interesting burial cave in the Cordilleras because of the presence of jars where the dead is placed. 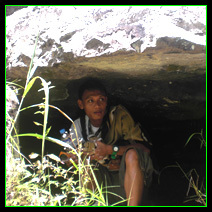 This burial cave is the grave of the Igorots' ancestors who died because of mass-poisoning according to legend. 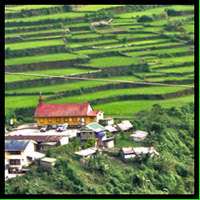 Samoki Village is located east of the Poblacion in Bontoc and can be reached through walking or riding on a jeep bound for Banaue. This village is home to local weavers who make straps, G-strings, etc. TEASER: "Each second counts, and each second that has passed means losing another second of their generation." who still wear their traditional clothes and accessories at home. The Chico River here in Bontoc especially in Alab Village has wide natural pools suitable for swimming. The children here love cooling down by swimming to one of the Chico River's natural pools. 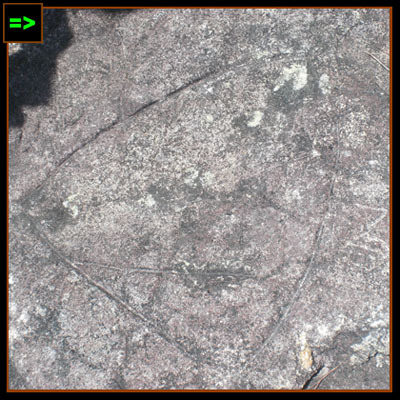 TEASER: "Prehistoric mountain dwellers inhabited this place leaving a mark that became an evidence of their existence." 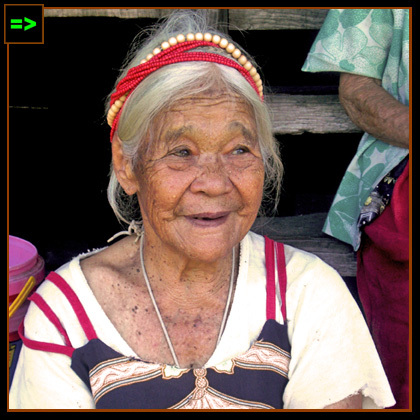 is an ancient dwelling of the Bontok Igorots and one of the evidences is the presence of the Petroglyphs. 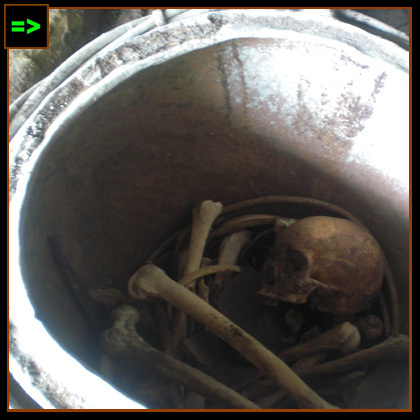 Enjoy the Burial Caves and the three sacred spots of the village. Ask your guide about it. TEASER: "...a lowlander can still witness their way of living, their traditions and everything a lowlander needs to know about their culture." is a province-wide cultural festival that happens in Bontoc every first week of April. The highlight of the festival is the street dancing and the cultural performances after the street dancing. The Halsema highway, a road that connects Baguio City and Bontoc, is in itself a tourist attraction. It winds through the Cordillera mountains and provides every voyager an astounding view of the highlands. If you are a thrill seeker, one of the adventurous things to do in Bontoc is to topload on a jeepney. This is the best way for you to enjoy the beautiful view of Mountain Province. How to go to Alab: Ride on a Baguio-bound or Sagada-bound bus (25 pesos) from Bontoc and drop to Alab waiting shade or hire a tricycle from Bontoc town proper and pay 120 pesos. Where to stay in Alab: There is no hotel or inn in Alab. You have to register at the Barangay Hall for arrangement. Where to get a guide: There are guides at the Barangay Hall upon request. Me, I met Ofelia Lopez. If you want her contact number, send me an email at edmaration@gmail.com. FAST FACTS: Due to it's high altitude and cool weather, Baguio is the Summer Capital of the Philippines. 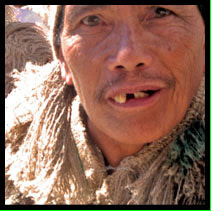 The city is also the home of the Ibaloi Igorots. PHOTO: Wearing traditional Igorot clothes at the Mines View Park in Baguio.-Bontoc route include D' Rising Sun and GL Lizardo. FAST FACTS: This Ilocos province has coastline that garnered the title "Surfing Mecca of the North". FAST FACTS: This town, dubbed as the Pearl of the Amburayan River serves as your gateway to the Ilocandias. PHOTO: Pinsal Falls (taken during dry season): Said to be the largest in Ilocos Region.. Be sure to be here by 7 am to catch the earliest van trip to Cervantes - 2 hours trip. Fare is 150 pesos. FAST FACTS: Cervantes is Ilocos Sur's summer capital due to it's cool weather. 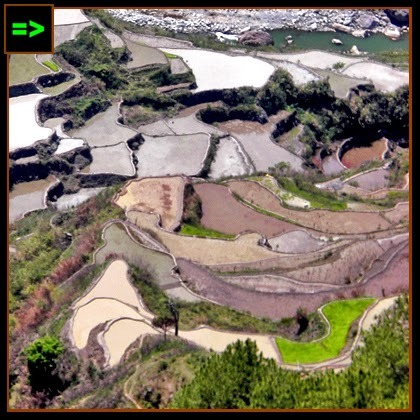 The town is the last stronghold of the Japanese forces during WWII..
PHOTO: Aluling Rice Terraces in Cervantes plaza to Bulaga. Fare from Cervantes to Bontoc by van is 130 pesos per head. Trip is 2 hours. (3) In case you didn't catch the van from Cervantes to Bontoc (last trip is around 1-2 pm), you can stay overnight in Cervantes, available lodging houses have rates of 200/pax (Bessang Traveler's Inn), 300-500/pax (Greenfields Lodge) and 1000+/pax (Villa Maria Inn). While in Cervantes, catch the jeep at 5:30 am in Bulaga. You can ride a tricycle from the Cervantes plaza. 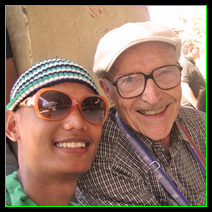 The owner of Greenfields can also take you to Bulaga as early as 5am to catch the jeep bound for Bontoc. Warning: This jeep is not available on Thursdays. Note: If you have your own service, you can cut the trip 2 hours shorter compared when you use the via Baguio route. There are a lot of places to stay in Bontoc usually ranging from 150-500pesos/pax. Tchapayan Hotel beside the Bontoc police station has 150/pax and 200/pax rooms. Not air-conditioned though, but Bontoc is cool, it was fine with me with the window open - with common CR. Meals are served at 80pesos per serving. Alabama Hotel has 200/pax rooms. Located along the main road. Not air-conditioned. With common CR. They don't serve meals. Walter Clapp has 300-500/pax rooms. This hotel is located at the parking area of Bontoc-Sagada jeeps. TEASER: "Just in case you are planning to visit this remote town for adventure or research purposes, I want to share this travel guide including points of interest that might awaken the curiosity in you." 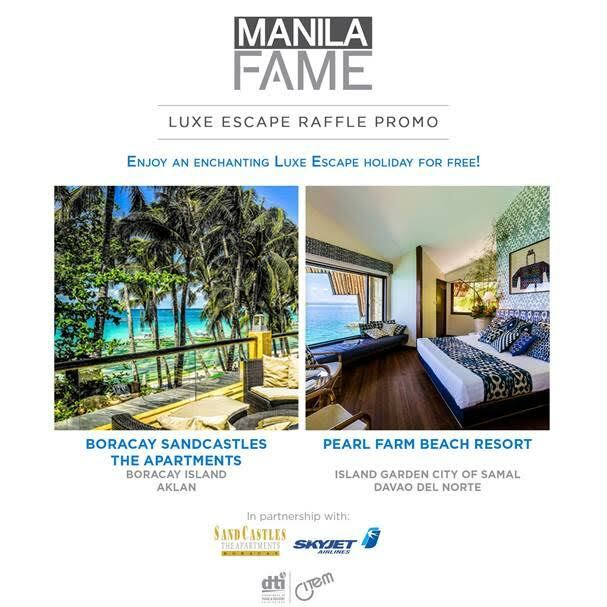 TEASER: "Maximize your time in Daraga, Albay. The bustling town is more than just the Cagsawa Ruins. I have made this simple travel guide to give all types of travelers an idea what to do in the town of Daraga." 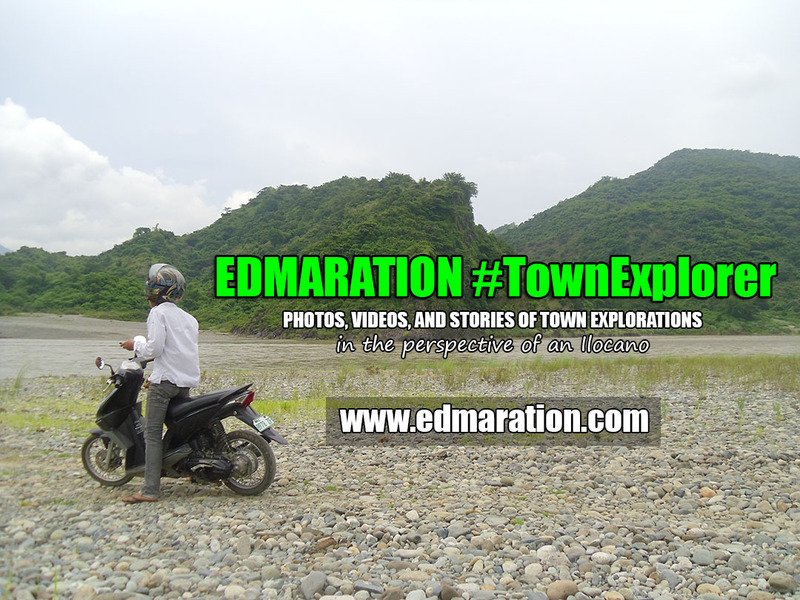 TEASER: "So you want to explore the town of Tagudin and you don't have any idea what this town has to offer? Let me help you based on my experience." Ang baba nman nung Ganga house :) Ganda ng rice terraces photos bro! Traveling Morion | Oo nga, ang baba at ang sikip hehe. Yes, maganda talaga yung place! nagadu met ti napanam! dami pala puwede puntahan dun! I should go back! Anonymous | Agyamannak ti panangkorihir yo apo. Sukatak to diay letrato. Kitak to dagidiay files ko! Dios ti Agngina! Thank you very much for exploring my hometown. I too, together with my family made a visit to Vigan April of 2013 via the newly built bridge connecting Cervantes and Tadian town. Kumbaga you came here, I went there. Mabuhay ka Edmar. Big thanks. mountainprovince.net | Wow! Great to hear po Mr/Sir Joel! I hope you enjoyed po Vigan! I am so happy Aluling Bridge in Cervantes is ok now. It has been a dream for me because I want to make Mt. Province as my playground. A lot of things I missed to see pa like Maligcong rice terraces, kaman-utek, can-eo village at marami pang iba! I will be back for sure via Cervantes. It cuts the trip shorter conveniently kasi eh! Cheers po and Agbiag dagiti umili ti Mt. province! 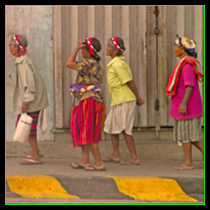 Anonymous | Undoubtedly :) The Igorot culture and heritage is just sooo rich! Levis | Thank you so much for reading. You know what, the first time I was with these people and in Bontoc, I was comfortable and I feel good with the place and the people. Until 3 days ago, I just learned that I have an ancestry from Bontoc! It feels great to know about that! Oh well, my great grandparents (paternal) were from Bontoc! hi! thank you for this entry re vigan-bontoc route. i'm planning to do the same in the next couple of weeks. how early do we leave vigan so we can be in bontoc within the day, catch the van from cervantes to bontoc? and how many van trips are there? we don't have that much time to explore sagada and banaue, before going to manila, i was hoping to be able to visit sagada early morning the next day and be in banaue after. do you think that's possible? thank you!!! 2. You must be in Bitalag Junction by 7am. 3. The earliest van going to Cervantes (from Bitalag) is 7am, or 8am. But better it you'll be here by 7am. Bitalag junction to Cervantes is 2 - 2.5 hours. 4. From Cervantes, ride on a Bontoc-bound van. I think the last trip to Bontoc is 1pm. Cervantes to Bontoc is roughly 2 hours. Thank you for this! I'm glad there are already vans going to Bontoc from Cervantes. Hope to get these on play by then... Thank you again! Don and Ji Beloy | Yup! Goodluck and Happy travel! Don and Ji Beloy | Wow! Congratulations there! Well I scanned your post, then I learned that Cervantes-Bontoc van is non-existent na pala (though there is a jeep plying a direct Cervantes-Bontoc route that departs daily at 5:30 am except Thursday). So I have to update this post to be more helpful for other trip planners. Thanks din sa info on your post, I'll grab some tidbits ha? Hehe..
yes, sure grab some... and maybe someday, we will... hehehe... thanks much!